PHOENIX – In an $80 million ($657,354 per acre) sale that sets the record for the highest price per acre ever paid for a housing development site in the Valley, R & R Riverview LLC in Fort Worth, Tex. (Reagan Horton, Ryan Horton, members) acquired a 121.7-acre (gross) tract surrounding the northeast corner of Tatum Boulevard and Bell Road in Phoenix. As BREW reported four weeks ago when it broke the news on the then pending property sale, D.R. Horton Inc. in Phoenix (Kim Oium, division pres.) has zoning approval to build 700 + homes on the land in a gated community being called Arabella. The sellers of the prime acreage were two entities formed by the Jean M. Marley Family Trust in Scottsdale (Jean Marley, trustee) and her sons, Jason Wesley of Scottsdale and Justin Wesley of Hermosa Beach, Calif. Nate Nathan, Dave Mullard, Courtney Buck and Casey Christensen of Nathan & Associates Inc. in Scottsdale negotiated the cash transaction. D.R. Horton in Phoenix, a division of D.R. Horton Inc. in Arlington, Tex. (NYSE:DHI), has been preserving its capital by using land bankers and by postponing and even cancelling property acquisitions in the Valley, according to multiple sources. 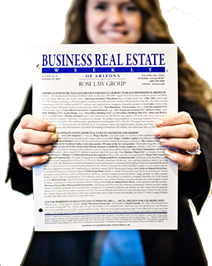 Word on the street among residential land brokers and other real estate professionals in the Phoenix-area, is that D.R. Horton is working to acquire another home builder. “Something is going down,” says a Valley real estate broker, who asked not to be identified. “I’m not exactly sure what D.R. Horton is doing, but they are getting ready to write a big check. I have never seen them behave like this.” As per D.R. Horton policy, representatives of the publicly-traded home building firm declined comment. An example of the odd behavior is the recent sale of the Marley tract in Phoenix to R & R Riverview LLC, which is owned by Reagan Horton and Ryan Horton, both sons of D.R. Horton Inc. founder and chairman Donald R. Horton. Although R & R Riverview has previously bought and sold an office project in Mesa, BREW has never reported the company serving as a land banker for D.R. Horton. And while Maricopa County records show the deal for the Arabella property was a cash transaction, a closer look at the public records show R & R Riverview LLC borrowed the $80 million from Donald R. Horton and Marty Horton, husband and wife. Industry sources say the structure of the purchase of the prime acreage surrounding Bell Road and Tatum Boulevard came together quickly as Marley and the Wesleys did not want to extend the closing of the infill site, which is mostly vacant except a horse stable and single-family home that the seller has been occupying. After a two year period to plan and zone the site, apparently the sellers did not want to delay the close. Although it is widely known that the Nathan & Associates agents marketed the property and negotiated the sale, none of the brokers would discuss the deal or even confirm their involvement in the transaction. Even with the public documents easily accessible on the recent record-breaking land sale, none of the Phoenix-area real estate executives contacted by BREW would speak on the record regarding D.R. Horton, which has been neck-and-neck with Lennar Corp. in Miami, Fla. (NYSE:LEN) for the top slot as the state and nation’s largest homebuilder. Some say D.R. Horton may be pushing to increase its market share following the $9.3 billion deal that Lennar completed last year when it acquired CalAtlantic Group Inc. in Arlington, County, Va. (NYSE:CAA), which was formed in 2015 with the merger of Ryland Homes and Standard Pacific Homes. Industry sources have speculated that D.R. Horton could be making a run at a number of builders that could be ripe for the picking. Meritage Homes Corp. in Scottsdale (NYSE:MTH), with 300 communities located in 9 states across the Sunbelt, has been a name frequently mentioned as a merger candidate for D.R. Horton. Richmond American Homes, a subsidiary of M.D.C. Holdings Inc. in Denver, Colo. (NYSE:MDC) also with operations in 9 states, has recently been linked as a target when it was learned that a D.R. Horton v.p. who is one of its key personnel in Phoenix was being transferred to Denver. The rumor mill has been ramped up since D.R. Horton top executives were sequestered on a cruise ship for nearly three weeks in February and March and returned with a mandate to hold off on land acquisitions and to keep all lots off the books until ready for use, says another source familiar with the company. D.R. Horton is increasing its home building activity across the Valley, in Tucson and in the other parts of the country partly because of its affiliation with the fast-growing Forestar (USA) Group Inc. of Dallas, Tex. That real estate development company and subsidiary of D.R. Horton has operations and land holdings in 24 markets in 14 states. In the past year, BREW has reported Forestar Group investing $25.782 million to buy properties in three southwest Phoenix locations to land bank a combined 943 lots for D.R. Horton. The relationship with Forestar Group and the deal completed with R & R Riverview allow the builder to preserve capital and keep the land expense off its balance sheet, says an executive of another Valley homebuilder. Described as the largest privately-owned undeveloped infill site remaining inside of the Loop 101, plans on file in the City of Phoenix for Arabella show 420 single-family detached residences and 286, attached duplex units in a three-phase development. Withey Morris PLC of Phoenix assisted D.R. Horton in the entitlement process for Arabella. 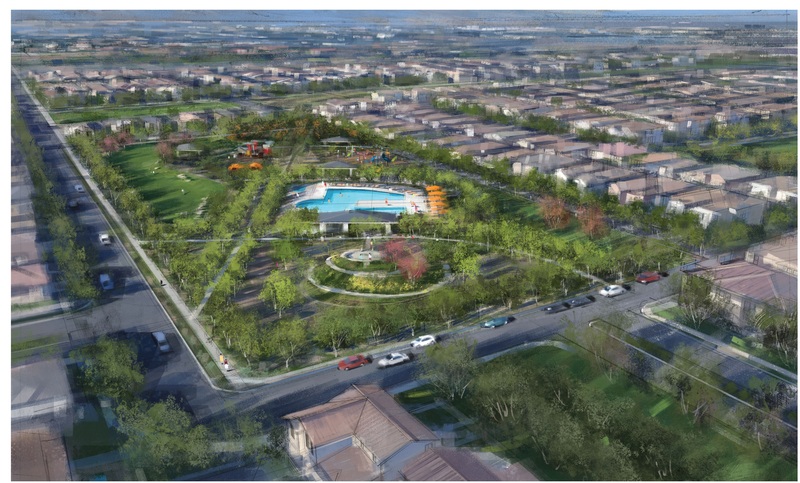 The homes will be connected through a series of trails, sidewalks and common areas, including a nearly 5-acre central amenity with a clubhouse, fitness center and pool complex. Of the planned 420 single-family residences, there are three lot products with 242 home sites averaging 3,750 sq. ft. (50x75), 142 averaging 5,400 sq. ft. (45x120) and 36 averaging 9,600 sq. ft. (80x120). The 286 duplex units are targeted for 27 acres that surround the 412-unit IMT Desert Ridge apartments. That multi-family complex is on the east and north sides of a retail plaza anchored by a Fry’s Food & Drug at the northeast corner of Bell Road and Tatum Boulevard. Roughly 20 percent of the Arabella community will be open space and common areas with a host of amenities for recreational uses, including game courts, a putting green and swimming pool. Plans also include a tot lot, and a picnic area with barbeques and ramadas. No word on construction timetable, product or pricing, but D.R. Horton will likely have some residences approaching the $1 million mark. The cost of the Marley property translates to a raw unit cost of $113,314 per home site. Including the infrastructure improvements and other costs associated with finishing the home sites, D.R. Horton will likely have an average of $150,000 per unit as a land basis for every residence the company builds within Arabella. Given the similarity in the lot sizes, the builder is expected to construct some of the same product the company has at its extremely popular Paradise Ridge community located a few miles to the northeast. That 262-unit project, at the southeast corner of Mayo Boulevard and 66th Street in Phoenix, is being developed on a 70-acre site D.R. Horton acquired from the Arizona State Land Department. Since beginning pre-sales a year ago, the builder has sold 110 homes priced from $550,000 to $950,000. That community figures to be completed in short order as D.R. Horton is spec building two-thirds of the residences at Paradise Ridge. In addition to the nearly 1,000 residences D.R. Horton plans to construct at Arabella and Paradise Ridge, the builder has two other planned communities in the northeast Phoenix area targeted for another 1,400 homes. D.R. Horton controls a 259-acre parcel located on the east side of the 5,700-acre Desert Ridge master-planned community in Phoenix that is approved by the City of Phoenix for up to 903 single-family and multi-family residences in a community being called Talinn. D.R. Horton is expected to sell a parcel within Talinn to its multi-family development division and some larger single-family lots to another home builder. In a fourth master-planned community D.R. Horton is developing in North Phoenix called Stone Butte (formerly known as Hillstone), the builder intends to construct roughly 500 residences on 265 acres located about two miles north of the Loop 101 at the north end of Cave Buttes Dam Road at Cave Creek Road. Find out more from Patrick Brown, v.p. of land acquisition and development at D.R. Horton, by calling (480) 483-0006. Blake Davis, D.R. Horton manager of acquisition, is at (480) 368-1041. Talk to Reagan Horton and Ryan Horton at (817) 737-9490. Reach the Nathan & Associates agents at (480) 367-0700.